Canine bone cancer is, unfortunately, one of the most common types of cancer in dogs. 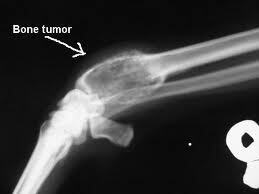 Osteosarcoma is the type of canine bone cancer most often seen. 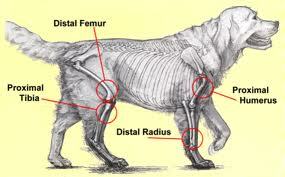 This is a type of canine cancer that starts on the surface of the bone and progresses into the center. The effectiveness of dog cancer treatment depends on several factors, one of which is the degree to which the cancer has infiltrated the bone, and especially if it has invaded the marrow space – the hollow portion in the center of the bone. The treatment of choice for most is surgery to remove the tumor. Usually, the entire limb is amputated, although sometimes bone-sparing surgery can be used depending on the size and extent of the tumor. A successful outcome with surgical removal of canine bone cancer depends primarily on whether the dog’s immune system can effectively fight off a recurrence of the tumor in some other part of the body after surgery. This is why immuno-modulation therapy is often recommended to follow up the surgery. Without immune therapy, the surgery alone almost never results in a complete remission. Unless something is done to enhance the dog’s immune system, the bone cancer will come back in 99% of the cases, regardless of how good the surgery is. Chemotherapy is often used to follow up the surgery, but unfortunately, chemotherapy does not work very well in most canine bone cancer cases. Radiation is also used, and this can be a good option, especially in reducing the associated pain when surgery is not possible. 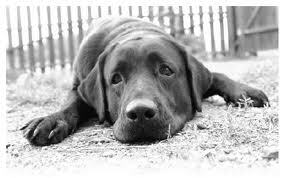 But it is important to understand that the chemo, surgery and radiation cannot by themselves cure a dog with cancer. It requires the dog’s own immune system to overcome the cancer. Even though we see bone cancer tumors form in one place, bone cancer in dogs is really a systemic disease. It requires a systemic response to overcome it. It has been our experience that surgery and/or radiation, with the addition of some form of immune modulation therapy such as K-9 Immunity™ or similar products, generally leads to a more favorable outcome than the surgery alone. All other things being equal, this seems to be the canine cancer which responds the best to immuno-modulation therapy. In younger or middle aged dogs, which are otherwise healthy, the results following surgery and treatment with the K-9 Immunity™ leads to a complete remission in a large percentage of canine osteosarcoma cases. Since the cost of chemotherapy, radiation and surgery can be quite high, we are often asked about using the K-9 Immunity™ alone with no other therapy. While this is not the best option in overcoming the disease, it sometimes works and sometimes it does not. 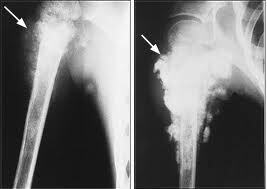 There are many factors involved in the successful outcome of Osteosarcoma treatment, or any other medical challenge. The dog’s age, diet, general state of health, other medications, previous history and genetic disposition all come into play. But there are many cases which we have direct knowledge of where the Immunomodulation therapy alone (K-9 Immunity™ & K9 Transfer Factor™) lead to complete remission of bone cancer in dogs. So there is hope. But you should always discuss this with your Vet. Diet is of Vital Importance! Cancer is the leading cause of death in American dogs. It is thought by many experts that diet is the main reason for this. We feed our dogs a diet that is based mostly around grain, even though none of the dog family feeds on grains in the wild. Not the wolves, or coyotes, or dingoes, or hyenas, none of them. 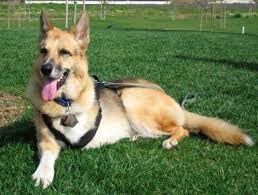 Dogs have not evolved the necessary enzymes to digest or utilize grain in their diet. They are primarily carnivores. When you feed a carnivore a diet based on grain, they will develop various immune dysfunctions, including cancer. If it is the diet that causes cancer in the first place, it seems pretty obvious that diet is an important part in treating a dog with cancer. In fact, diet is one of the most important factors in a successful treatment of mast cell tumors! To give the dog the best possible chance of overcoming this challenge, the proper nutrients must be fed. Don’t make the mistake of thinking just because a dog food is expensive, or because it is recommended by the vet or has a fancy name that it is necessarily the best food for your cancer patient. There are some good recommendations for dog cancer diets found on the Dog Cancer Diet page. An immune-modulator is something that helps regulate the immune system. K-9 Immunity™ was first developed for guide dogs for the blind being treated for cancer, and is now available to clinics, veterinarians and direct to the public. 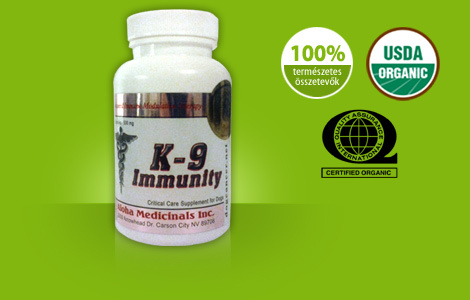 K-9 Immunity™ has been used in over 10,000 dogs with cancer, with outstanding success. Talk to your vet to see if immune supplementation may help your pet, or you can order direct and get started today! K-9 Immunity™ contains a class of immune-modulator compounds called hetero-polysaccharides, including PSK, PSP and Lentinan, which are the three most widely used anticancer compounds in the world today. This formula also contains nearly 200 other closely related polysaccharide which trigger other aspects of immune function. These compounds are sometimes referred to as glyconutrients, and are required for correct immune function in all mammals. K-9 Immunity™ is an all-natural, non-toxic daily supplement made from 100% USDA Certified Organic materials.